Puff-puff as it is known in Nigeria is called Bofrot in Ghana. 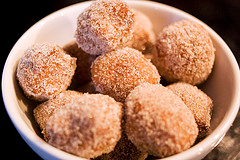 Bofrot is a traditional African snack similar to an American doughnut hole. The recipe is very versatile, be creative with your puff-puff snack tonight!